How to improve your game this winter! Have you got the winter-time blues? Why not use this time of year to reflect on your 2015 golf season and how to improve your game in 2016! A good goal for most golfers would be to lower your handicap by 2-4 strokes. Newer golfers can drop their average score by even more! 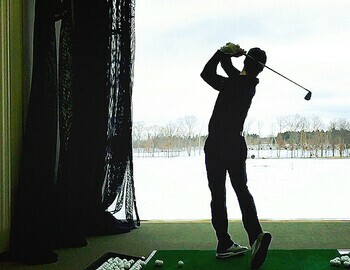 A great way to do this is to set up a structured lesson plan and practice time with a qualified PGA or LPGA instructor. If you are already a regular golfer, knowing your stats for greens in regulation, average putts per hole, penalty strokes and scrambling proficiency will help not only to know where you need to improve but give your instructor an insight into the state of your game. There are a number of ways to track this type of information, but one option is to download an app that can keep these stats, such as the GolfPad App. Then, find your coach, sit down and develop a plan for success in 2016. Going from shooting over 100 to in the 90's, or 90's to 80's is possible this year with the right instructor and the right plan! The fun begins now! Contact the Game Improvement Team at 1757 to get started!